The mesmerizing orange and red hued lights set above the audience on the floor encaptured the blissful mood that Kanye West created at the Quicken Loans Arena for his Saint Pablo Tour on Saturday, October 1. His innovative creations and inspirational drive paid off as he performed a piece of, arguably, the best tour of his career. He strategically incorporated the audience, making them a large part of the performance. Before the show began, fans anxiously waited for Yeezy’s appearance during a two-hour delay caused by the entrance process. Despite the malfunction, fog and eerie instrumental music set the mood once in the arena, getting the crowd excited for the moments to come. As soon as the lights went down and his stage rose up, the energy was vibrant. 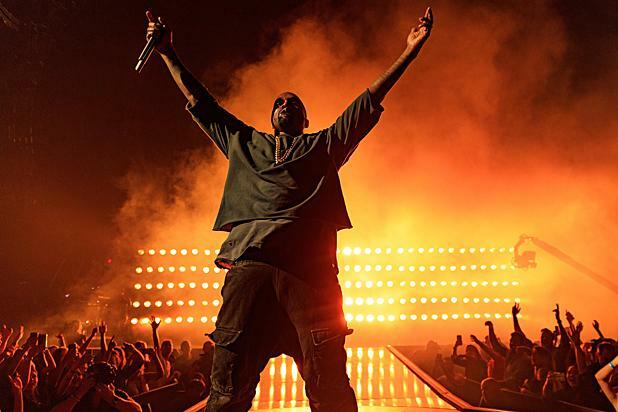 Some might say there is no other tour that has achieved what the Saint Pablo tour is doing. A moving stage above the audience, captivating lighting that highlights parts of the audience’s vitality, and mist rising in a dreamlike state from the fans’ feet all help label this show as something unique. In our world today, where it seems like every possible idea has been thought of by the unmeasurable amount of young musicians, Kanye has proven that new ideas never cease to end. Looking around, not one person in the audience was worried about anything other than letting loose and having fun. Fans kept their eyes on the stage as it was lowered towards them, and they were able to connect with Kanye closely. When the beat fastened, their energy crossed over to an ecstatic state as they danced the night away with their own personal flair. Starting off with hits from his new album, Kanye jumped around altering between upbeat and slower tracks. The set list also included songs from various albums pushing all the way back to Heartbreaker– everyone’s favorite middle school hit. Strangers sang and danced together, friends hugged each other in awe, and the smiles never stopped; it was pure bliss. One realization made clear is that Kanye West has been influencing our generation since 2004. Whether he is well liked or not, he’s made large impact on pop culture. And just like that, the show ended; the stage lowered, the arena lights flashed on, and everyone stood silently. Everyone in the crowd tried to process what they had just become a part of, and there was not one negative comment made in earshot. Kanye West’s Saint Pablo tour will come to a close in Detroit on December 22nd due to a reschedule after Kim Kardashian’s unfortunate robbery in Paris, according to E News. Hopefully he will continue his cutting-edge music career and grace his fans with another tour in the near future.